Today I have a Christmas card that I made using the Stampin’ Up! Flurry of Wishes stamp set from the Holiday catalog. This card was inspired by the Mojo Monday Tall and Skinny sketch. A Tall and Skinny card measures 9″ x 4″. Cardstocks: Pool Party makes up the base with a layer of Whisper White and Dazzling Diamonds Glimmer paper. 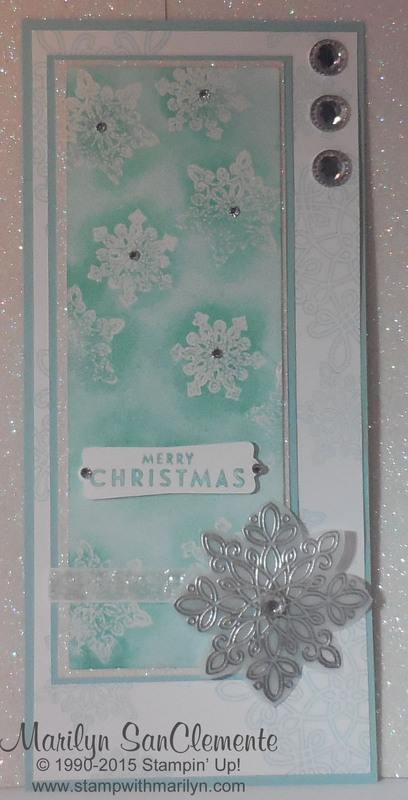 The Whisper White background is stamped with the large snowflake from the Flurry of Wishes stamp set with Soft sky ink. The Whisper White piece on top measures 2 1/2″ x 6 7/8″. The snowflakes are stamped with White Craft ink and then embossed to create the snowflake background for resist. Next I used a brayer with soft sky ink over the area of the whisper white piece. I brayered 4 layers of soft sky to get the light blue background. Next I brayered the piece with 3 layers of Pool Party ink. Then I used a sponge dauber with Pool Party ink over the snowflakes to fill in the crevices around the embossed images. This brings out the details of the snowflakes. This piece is layered on a piece of Dazzling Diamonds Glimmer paper and another piece of Pool Party Cardstock. I added a piece of the White Glitter Ribbon from the Holiday catalog. The medium snowflake is stamped with Silver Ink and embossed with Silver Embossing powder. The center of the Silver snowflake is enhanced with an Iced Rhinestone Embellishment. Three of the larger Iced Rhinestone Embellishments are added to the top left of the card. Rhinestone jewels have been added to the center of the snowflakes. I love the combination of these Blues and Silver with the Snowflake images! Look at this GORGEOUS background, oh my! I love every inch of this!! !